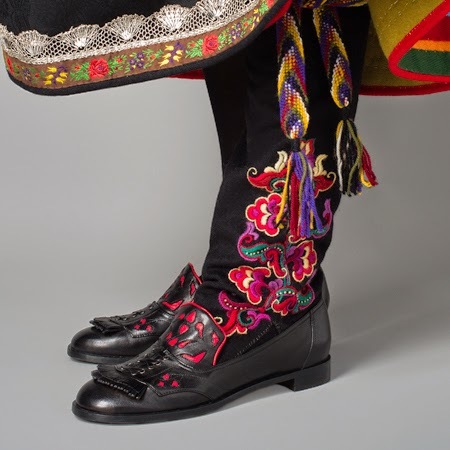 The East Telemark costume is known for its embroidery, and also for the elaborate ornament on both stockings and shoes. 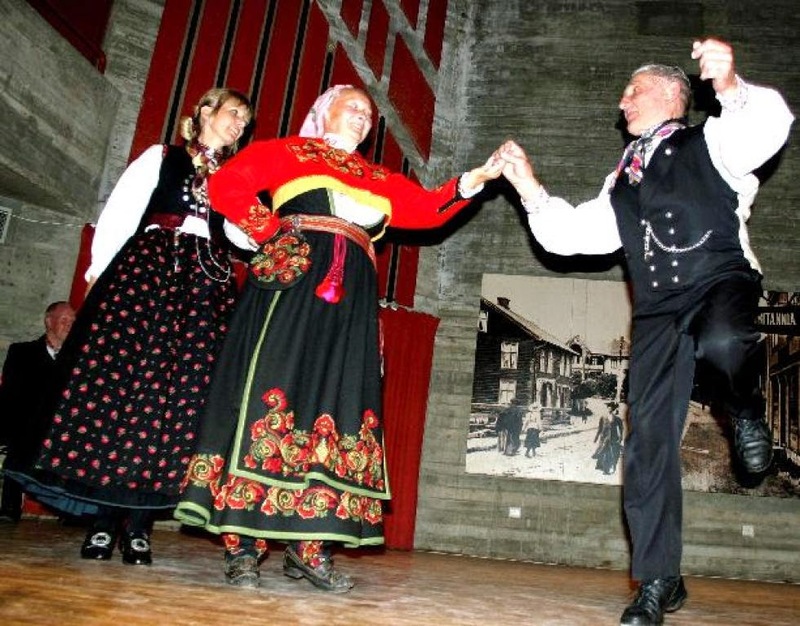 Above is a photo of the famous Telemark dance teacher, Karin Brennesvik, likely doing Telegangar. 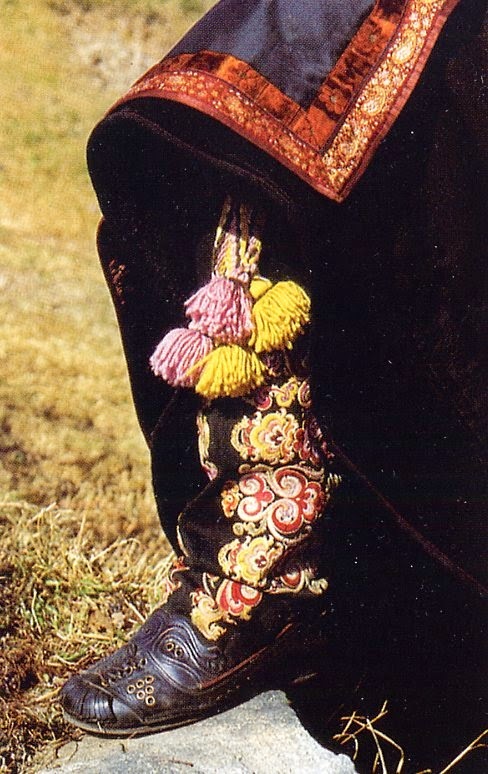 You can see the embroidery on the stockings, and a hint of the ornament on the shoes. 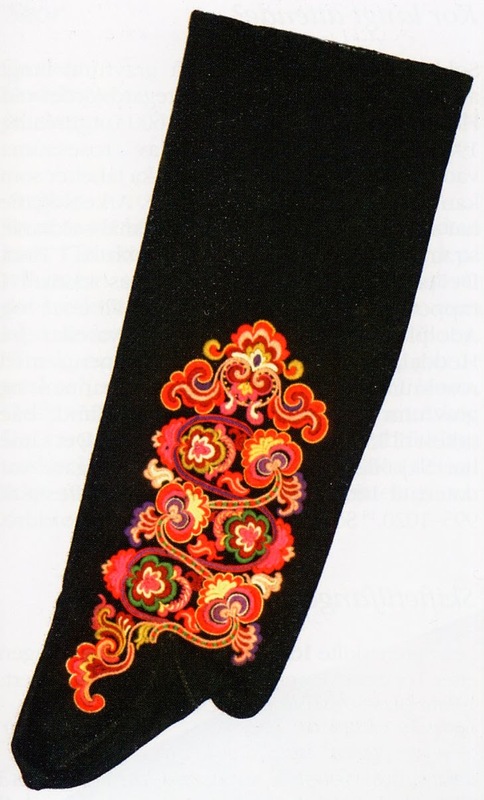 Here is a closeup of a similar stocking. 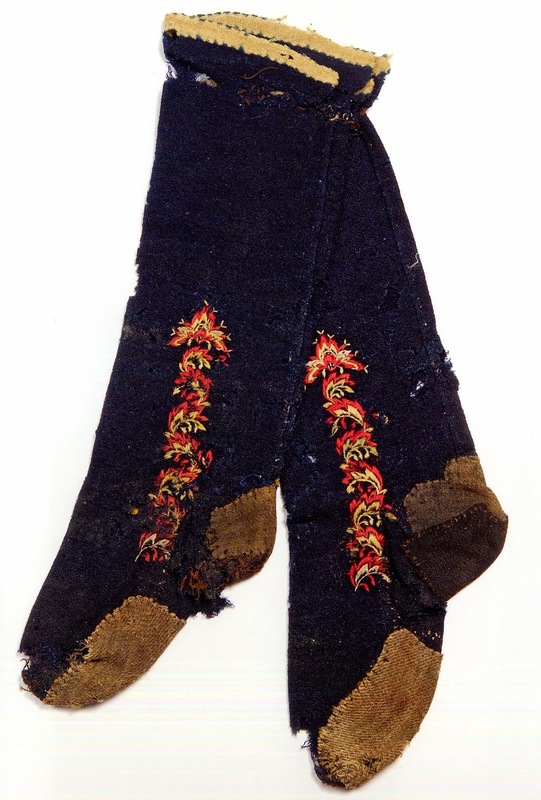 Stockings of woven cloth, vadmal, were popular in many places, and were used in Telemark in the mid 1800's. 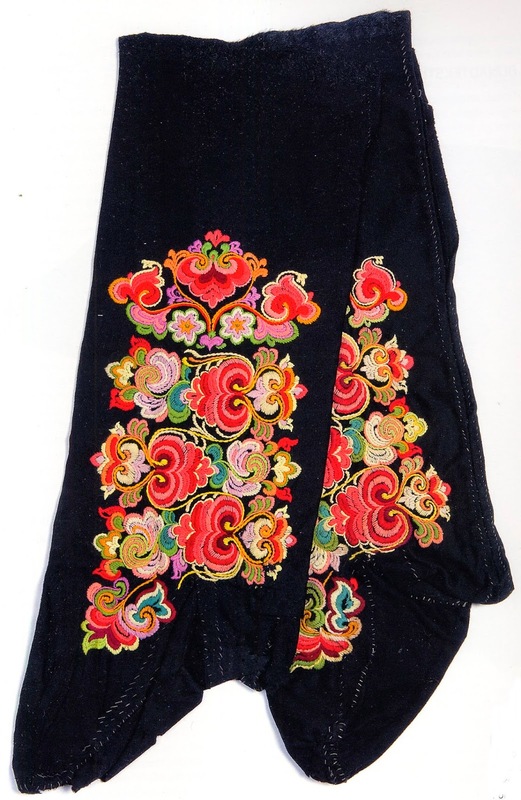 They were superceded for a while by knit stockings, which fit to the legs better, but now the older form is making somewhat of a comeback, as they are excellent for showing off the elaborate embroidery of Telemark. 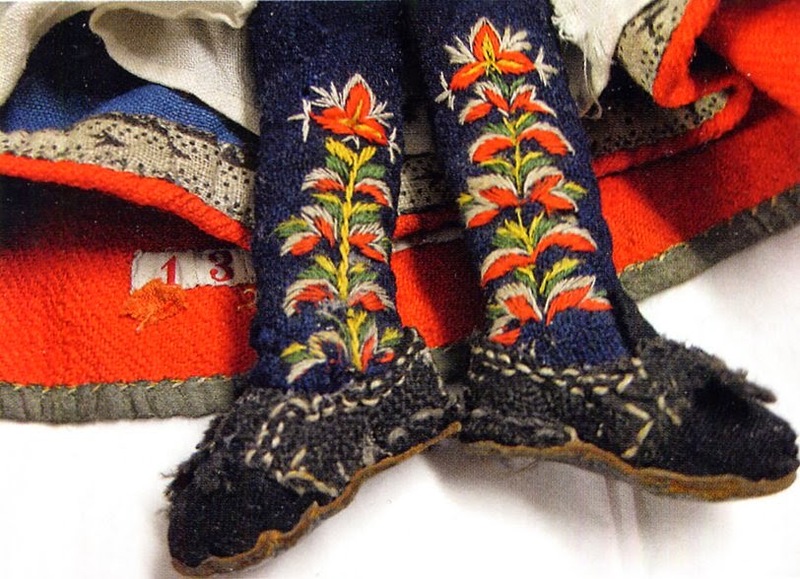 Aagot Noss has done some impressive research into the folk costumes of Norway, especially Telemark, and has identified three cuts which were and are used to make these stockings. Type 2 has the toe cap knitted and sewn on. 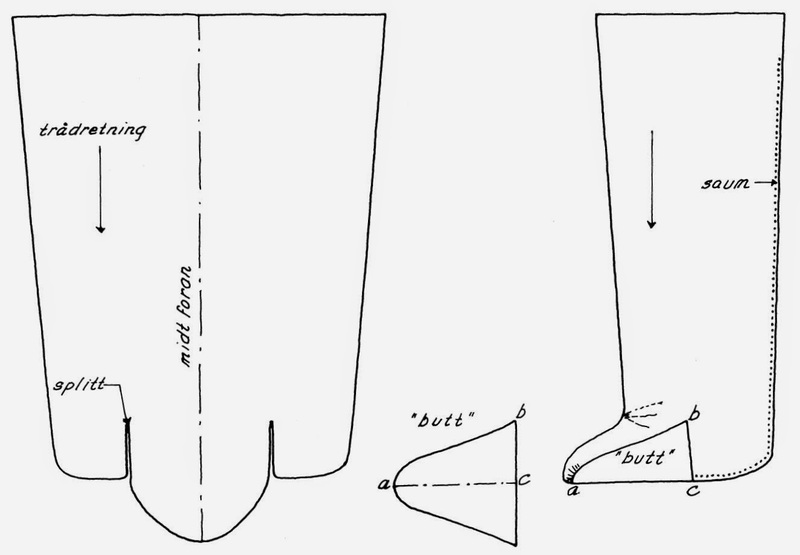 This type of stocking absolutely requires the use of garters to stay up, which are tied around the leg above the calf. 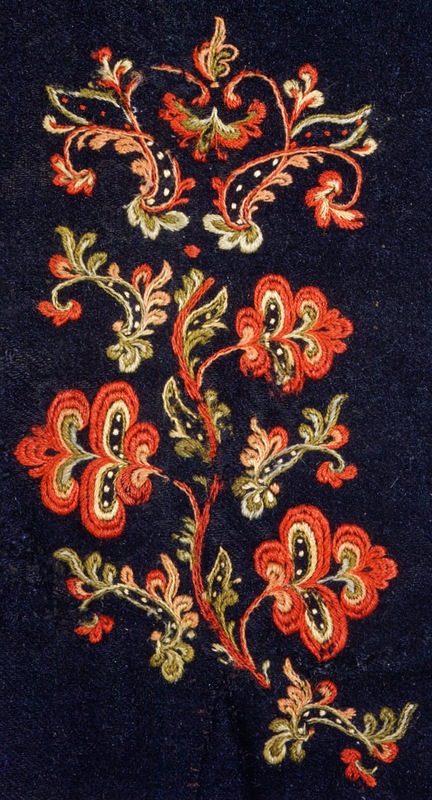 The flat field of cloth makes an excellent location for embroidery, however. 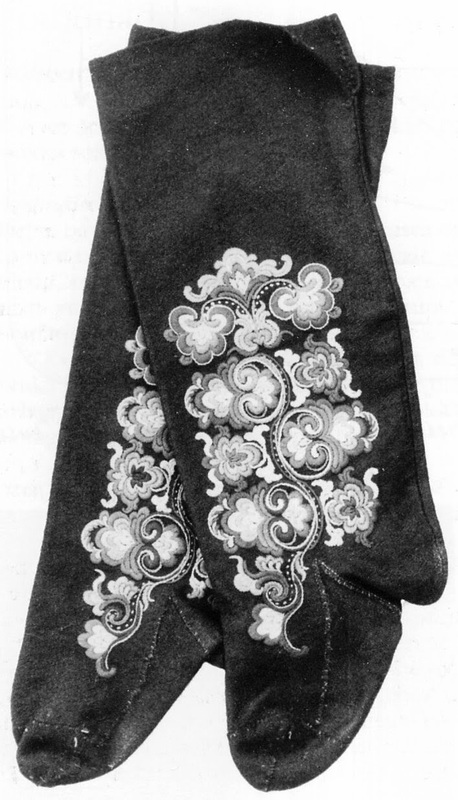 The embroidery is of the type called Rosesaum, and is done before the stockings are sewn together. 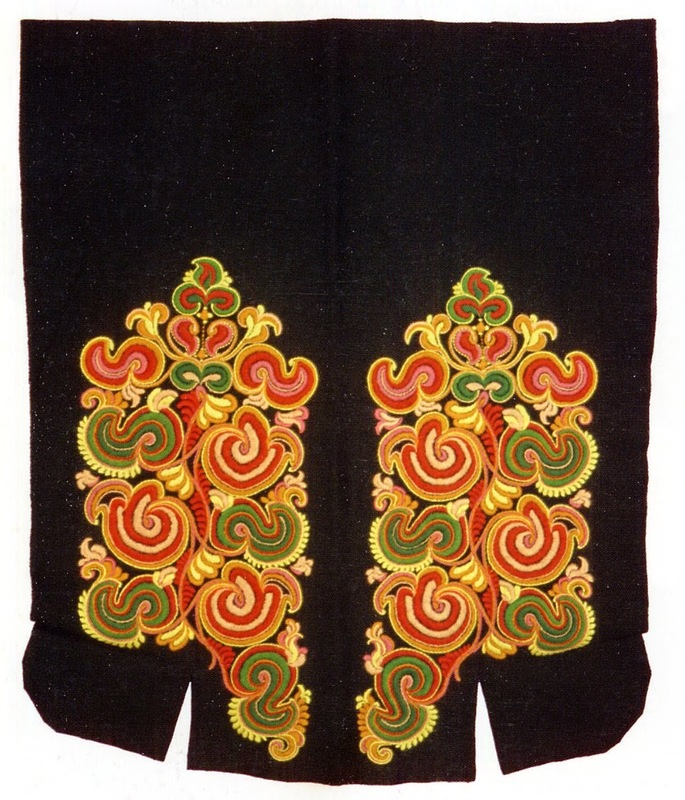 Both the colors and the extent of the embroidery vary. 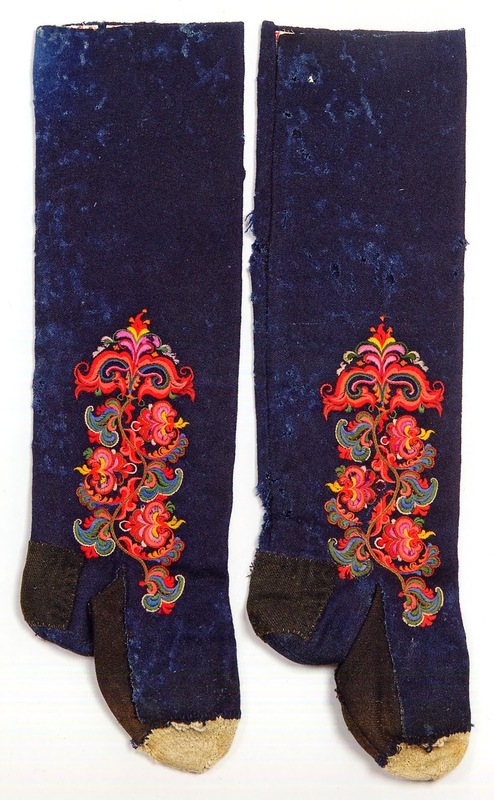 The stockings, when worn, look baggy to modern eyes, but the embroidery more than makes up for it. 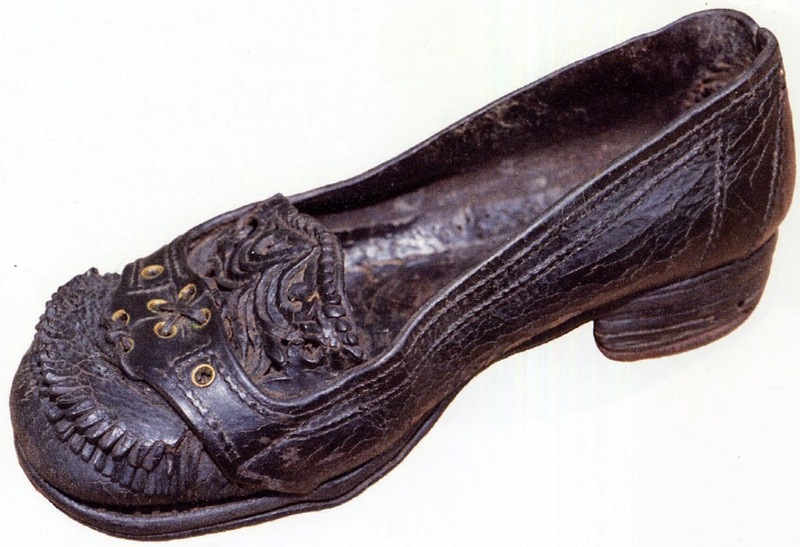 Here are some more images of this type of footwear. 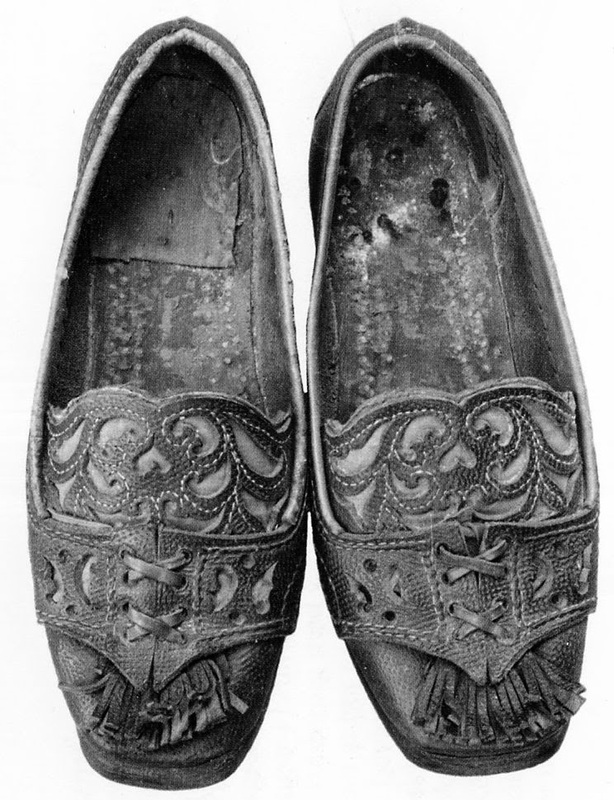 These are worn with both the Raudtroje and the Beltestakk costumes. 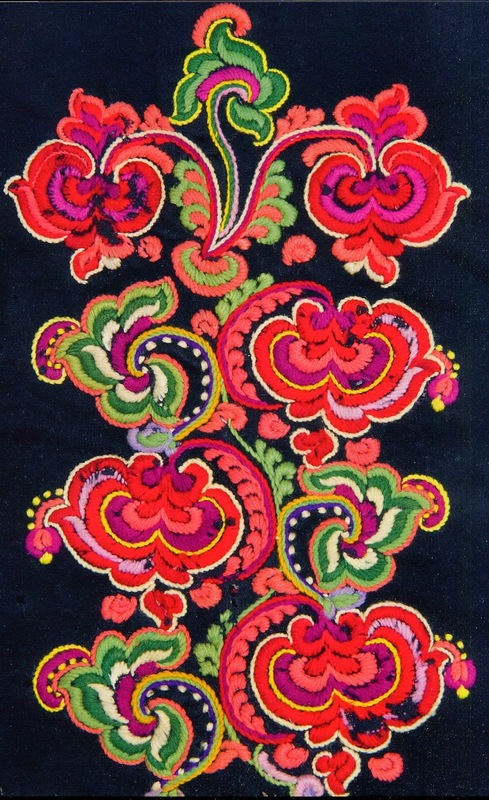 The composition of the embroidery is usually similar. 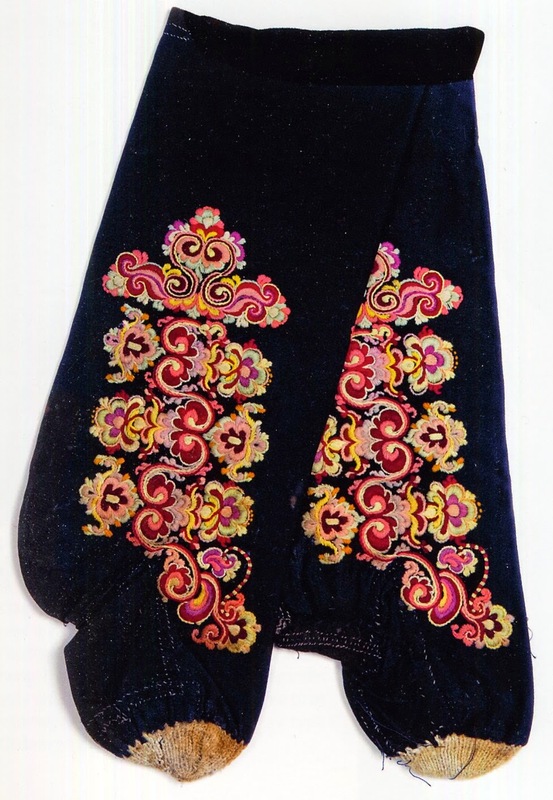 This is part of an antique doll which was meticulously clad in the folk costume. 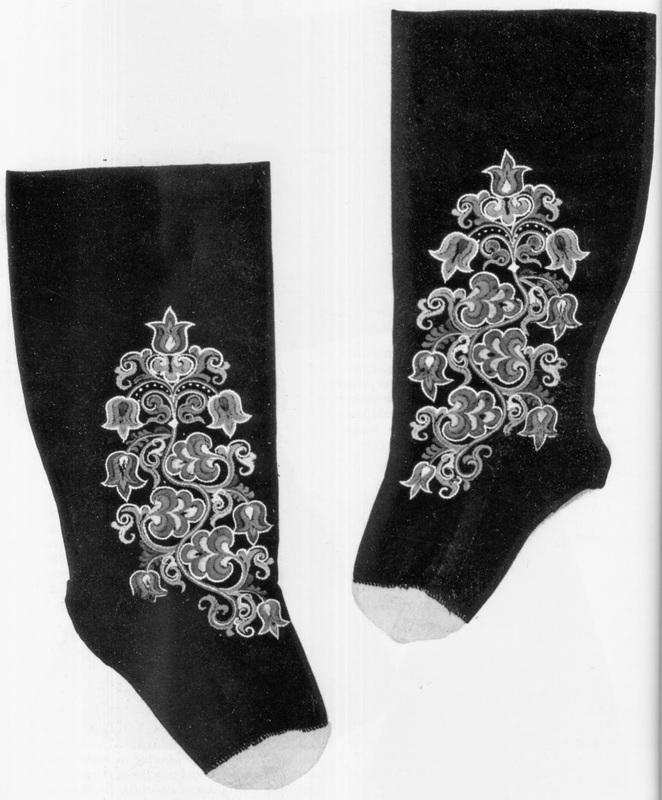 On the left is an old stocking, and on the right is a modern copy which varies somewhat from the original. I admit to liking the original better. 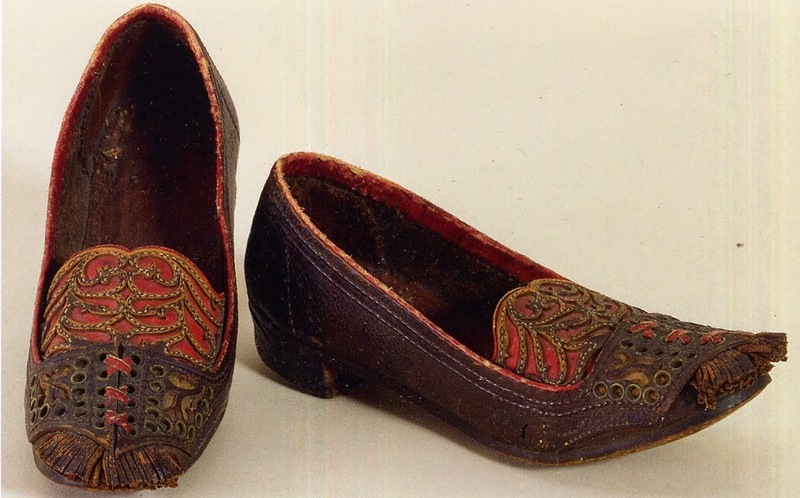 The shoes were made with cutwork in the leather, black over red, and various other ornaments. Thank you for reading, I hope that you have found this interesting and inspiring. 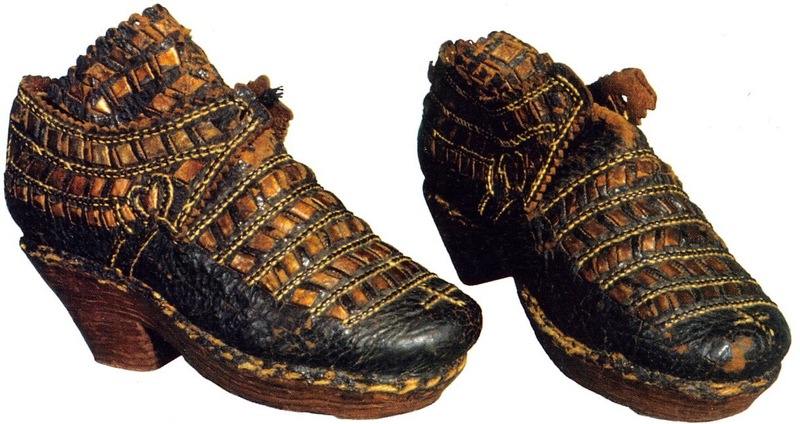 Thanks Roman, I don't think I've ever seen such beautiful shoes and socks! 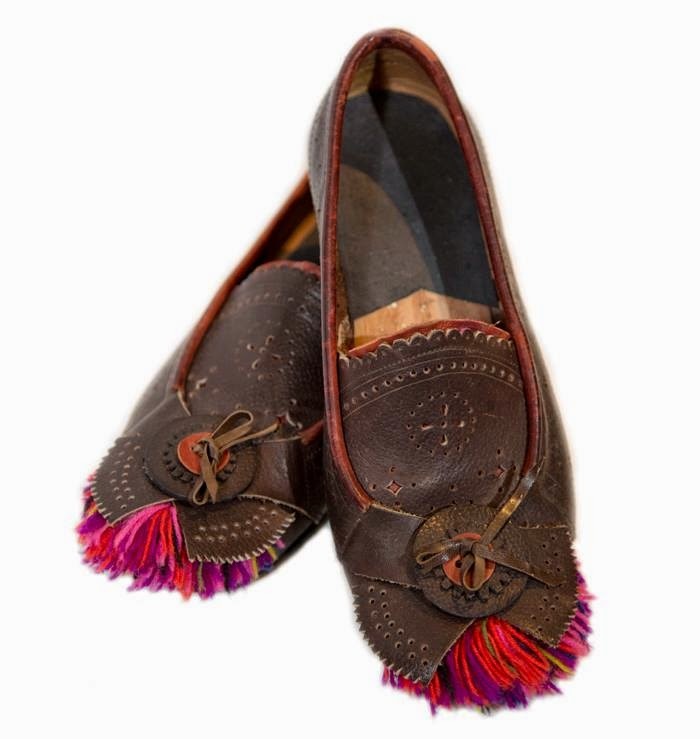 Quite a treat; I love these. 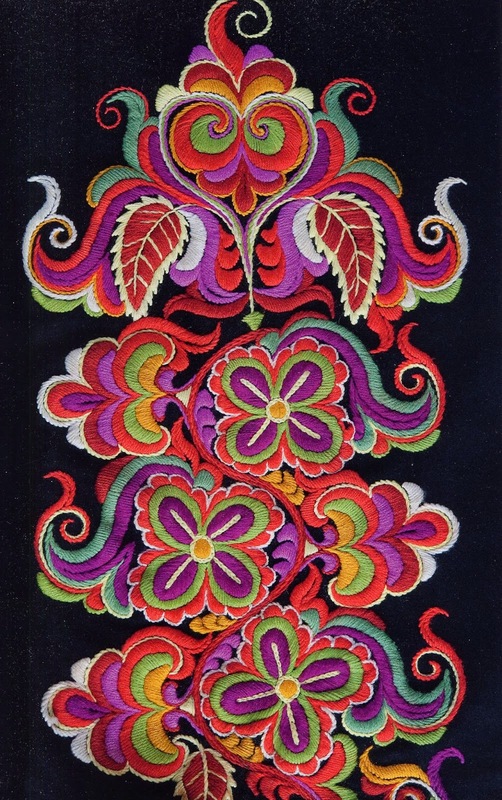 You've inspired me to try my hand at some of this embroidery. 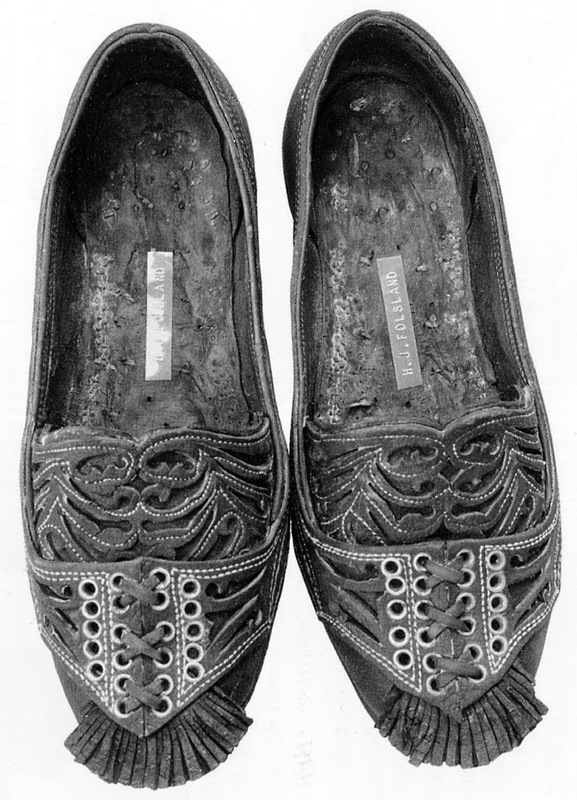 This is truly a blog like no other; thank you! 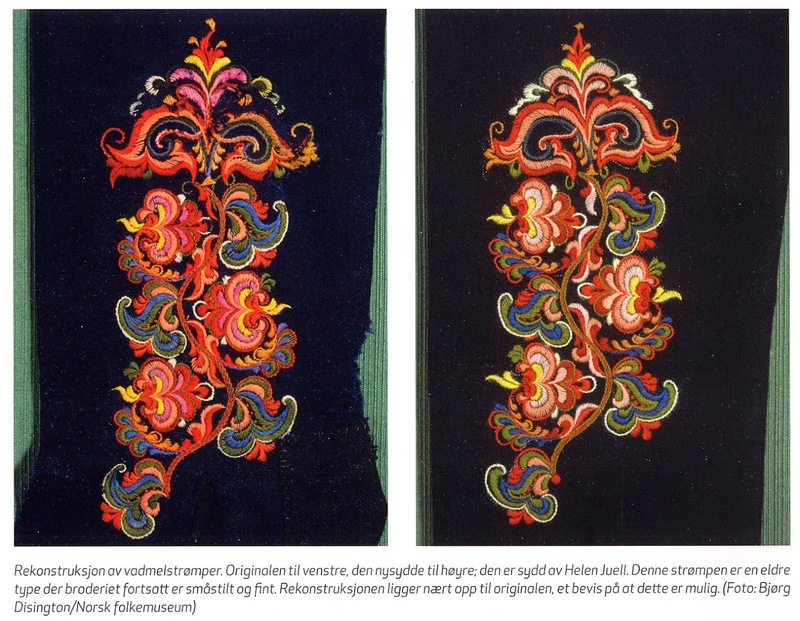 I would love to do this type of embroidery. 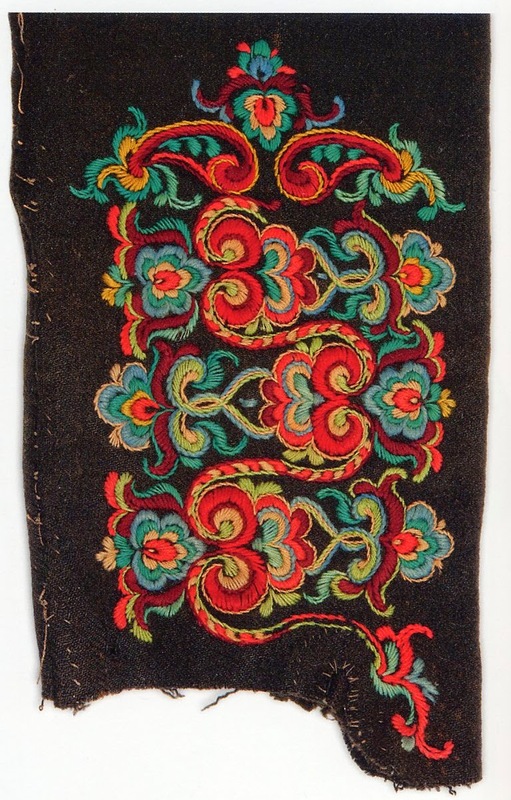 How do I get the patterns and instructions for the East Telemark type of bound embroidery? 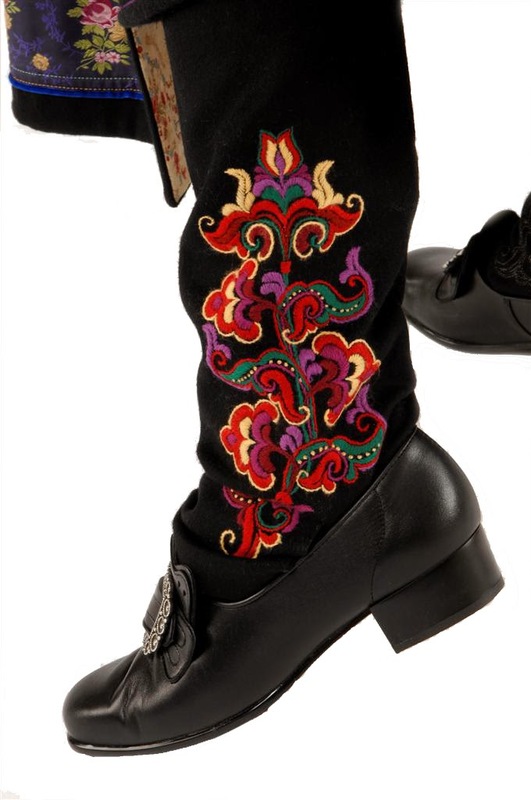 there are many designs on this and other of my articles. 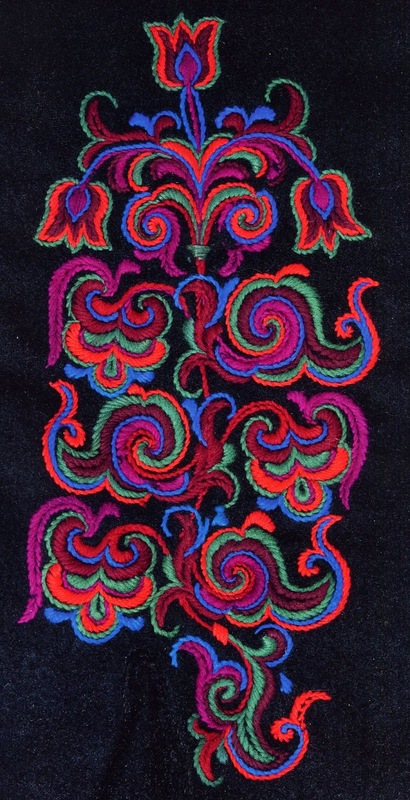 These types of designs were drawn on the cloth before embroidering. 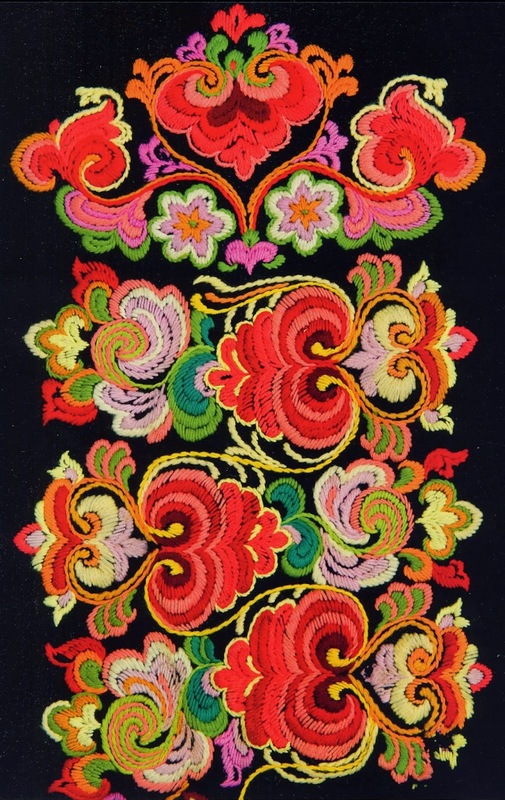 the stitches only consist of satin stitch, stem stich, and sometimes french knots. 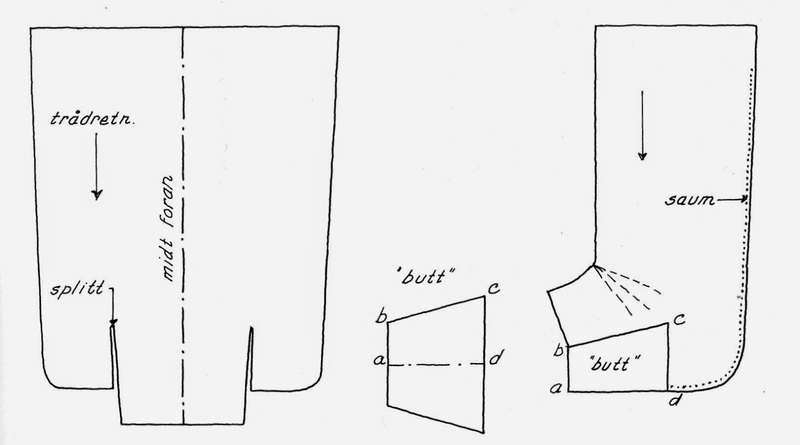 save images from my blog and trace them or draw others in the same style.